The fate of T in the Park 2015 lies in the hands (or wings) of a pair of ospreys who have in spite of organisers best attempts, returned to their old nest near Strathallan Estate where the event is to be held. The very rare and highly protected birds of prey were allegedly sighted visiting their long-term nest on Monday, in spite of the fact that TITP organiser DF Concerts had previously made attempts to push them into a new custom built nest. If the ospreys have in fact returned to their former home, a buffer zone of 2500ft will need to be left to ensure they are not disturbed by the goings on at the three-day festival. This buffer zone would significantly encroach on the planned festival site. "fully satisfied" the birds had returned to the old nest. So what will this mean for the festival? Will the venue need to be changed? What if it goes ahead and the birds are disturbed? What penalties could festival goers face if they intervene or disturb the birds unintentionally? Ospreys are afforded the highest possible protection under the Wildlife and Countryside Act - it is a criminal offence to disturb them during the nesting and breeding season. Under Schedule 1 of the Wildlife and Countryside Act 1981, it is an offence to intentionally take, injure or kill an osprey or to take, damage or destroy its nest, eggs or young. Furthermore, it is also an offence to intentionally or recklessly disturb the birds close to their nest during the breeding season. Those who violate the law can be fined up to £5,000 per offence, and also face a prison sentence of up to six months. The birds are given even further protection in Scotland, The Nature Conservation (Scotland) Act 2004 extends the law to people bringing birds, or their eggs, from other countries into Scotland. Such individuals will have committed an offence if the taking or selling of that particular bird or egg would have constituted an offence had it taken place in Scotland. In addition, some birds, including many birds of prey such as the Osprey, are further protected by making it an offence to intentionally or recklessly disturb them while they are building, or are in, or near a nest containing eggs or young, or to disturb their dependent young. Under the act it is also an offence to intentionally or recklessly obstruct or prevent any wild bird from using its nest. DF concerts used tactics such as balloons, flags, and a fully extended cherry picker near the nest to encourage the ospreys to roost away from Strathallan. RSPB Scotland previously condemned these actions as "unethical and unacceptable" - although they did not reach the threshold for being illegal. "We are aware that the ospreys have been reported at the nest site and indeed we have some video footage that shows one of them alighting on the nest with a stick. This blatantly means this is now an active nest and is protected from disturbance so the cherry picker should have been removed immediately. As this nest is closer to the main festival activity, the risk that the birds will be disturbed by the festival has increased and that will be reflected in our response to the planning application." 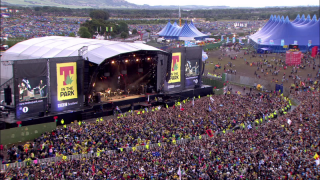 At present, DF Concerts do not have the requisite planning permission to hold the festival attracting up to 85,000 people each day. There will now be a 28-day consultation period with a decision on the planning application made by Perth and Kinross Council anticipated in May. This will give relevant parties an opportunity to put forward opinion and evidence as to whether the site is suitable to host the festival in light of the potentially nesting osprey. "We've seen a copy of the video referred to by RSPB and it does not correspond with the ongoing monitoring from our ornithologist on site. We are fully aware of and compliant with the legal protocol and as such, we have asked the police and RSPB to seek further information so that the video's authenticity can be fully examined. We have removed the cherry picker while we wait for this information." It will be interesting to see the outcome of the consultation and also the level of interest expressed by relevant parties. For more information about planning permission, read our free legal guides here. If you think the Osprey should be kept out of T in the Park, express your concerns here. If you think Kanye West Should be kept out of Glastonbury, express your concerns here.